I've got a unicorn and then some. Replacing heater hoses on the 524td, and this coolant hose is NLA. Can't find it anywhere. Any other options I've overlooked? Do you happen to know the part number? How about one of these things and some straight hose? In theory you could reshape a hose if you could make a form, pressurize the form to 90 psi, and heat it at ~330F for ~20 minutes. Other than that being practically impossible on a home scale it's an option. 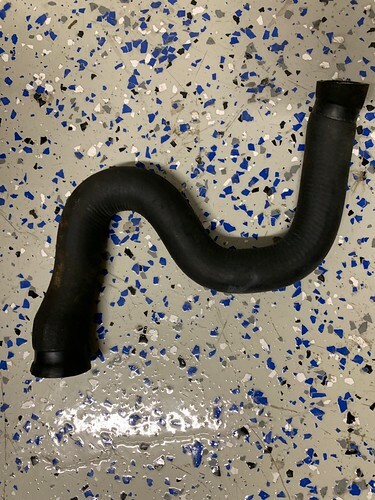 Since it's a heater core hose (I think) how about finding one from an M20 E28? There's a good chance that they are similar. I checked the M20 diagrams, seems different. This is one of the hoses off the 4 way T.
I looked into the springy thing but there's 2 bends, different diameters at each end, and a little rise at one end. My remaining options are: cut off a bit of the existing hose and clamp in a new spot, hoping it will reach. Or, ship this off to China somewhere, and have them make me one. I don't think this can be 3D printed otherwise it would be a good candidate.